Namati has recently launched the Community-Investor Negotiation Guides. These two first-of-their-kind resources support communities and frontline advocates to prepare for, and if they so wish, engage in empowered contract negotiations with investors seeking to use community lands and natural resources. Across the globe, governments, national elites, and international businesses are aggressively pursuing community lands and resources for mining, logging, agribusiness and infrastructure projects. These investors, who often approach communities hand-in-hand with government officials, police, or military, or who are members of these groups themselves, sometimes use their power to intimidate communities into signing contracts that strip them of their lands and natural resources. In exchange for their lands, investors often promise communities significant benefits – schools, roads, clinics, jobs, and seemingly-large rental payments. Many of those promises are not kept. Communities – lacking legal literacy and support – are often manipulated into signing contracts that evict them from their lands, degrade their environments, and deny them fair compensation and legal remedies. 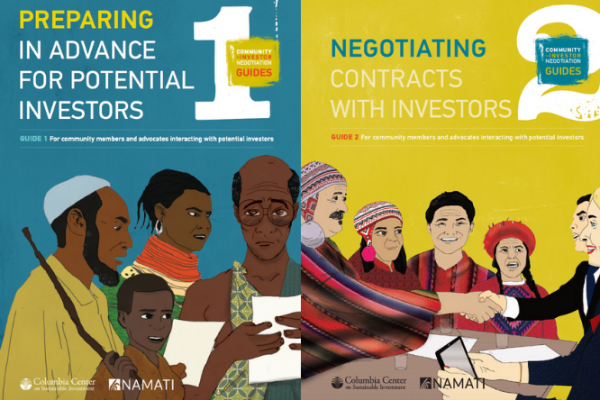 To counter such widespread injustice, the Community-Investor Negotiation Guides, developed by Namati and the Columbia Center on Sustainable Investment, provide communities and frontline advocates with concrete, practical strategies to understand their rights, fend off unjust investments, and ensure that community prosperity is at the center of all negotiations. Guide 1, Preparing in Advance for Potential Investors: This resource helps communities understand their legal rights and prepare themselves before investors arrive. Strategies include creating a vision for their future, assessing the value of their lands and natural resources, and developing rules to ensure all community voices are authentically included in decision-making about investments. Crucially, this guide supports communities as they decide whether or not to enter into discussions or negotiations with an investor. Guide 2, Negotiating Contracts with Investors: If a community has decided to negotiate with an investor, this guide explains and provides examples of common contract terms that protect community interests, sets out problematic language that should be avoided, and helps communities negotiate clear, fair, and equitable contracts that ensure long-term prosperity. Allowing an investor to use community lands and natural resources is one of the most important decisions a community can make. The practical lessons in these guides prepare communities to engage with investors from a place of empowerment, to ensure that community prosperity is not only a promise, but an enforceable reality.